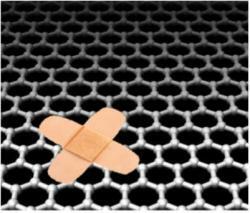 Graphene fixes itself: Graphene uses loose carbon atoms to re-knit its damaged structure.Courtesy ksoAs a happy accident, scientists from the University of Manchester learned that graphene (sheets of carbon atoms arranged in a honeycomb crystal lattice, just one atom thick – think chicken wire) can repair itself spontaneously. Graphene is a semi-metal that conducts electricity very easily. It has potential uses in not only electronics, but also DNA sequencing, desalination, and it has been found to be a great antimicrobial. The Manchester researchers were originally trying to understand how metals react with graphene, which will be an important part of incorporating it into everyday electronic devices. They found, much to their dismay, that some metals actually damaged graphene’s structure by punching holes in its neatly-arranged lattice. This is not a good thing if you’re trying to create a graphene-based device. However, quite unexpectedly, the graphene started to mend itself spontaneously, using nearby loose carbon atoms! As stated by the Scientific Director at the Daresbury Laboratory, Dr. Quentin Ramasse, this could mean the “difference between a working device and a proof of concept with no real application.” It also means that graphene just jumped to the top of my “baller carbon allotropes” list.